CHILL The Highest Chocolate puts two of the best things in the universe in one chocolate bar. The Cappuccino Crunch is a delicious mixture of finely crushed espresso beans finely crushed espresso beans and smooth milk chocolate. 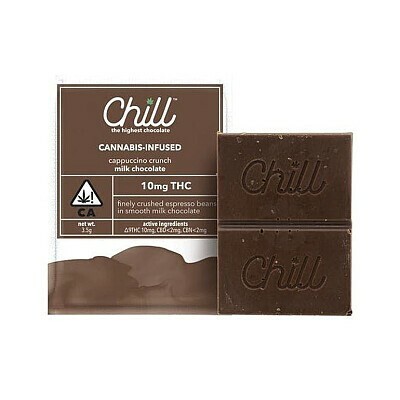 The pros at CHILL created this premium dessert with the best ethically sourced ingredients and 10 mg of CO2-extracted THC and less than five (5) mg of CBD. This Chill bar is set to raise the bar way high.